A Blandings turtle seen in 2004. New efforts are underway to protect turtles along Cootes Drive. 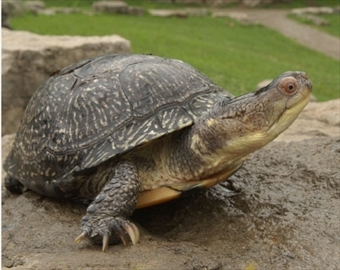 The Royal Botanical Gardens and the Hamilton Conservation Authority Foundation are ramping up efforts to prevent a fragile population of turtles and other wildlife from getting run over by vehicles on Cootes Drive. The RBG wants to build a permanent fence, three-quarters of a kilometre long, that is expected to cost more than $30,000, on the east side of the road near the edge of McMaster University property and swinging west towards Olympic Drive. The fence would direct spring migrating turtles along the roadside to a safe crossover point under a bridge. For years, the turtles have been crossing the road in search of sandy terrain to lay eggs. For the past two years the RBG has experimented with temporary silt fences, but decided recently to go ahead with a permanent structure. Meanwhile, the HCA Foundation — which owns nearby property on the west side of Cootes Drive — just finished a fundraising campaign that quickly raised $1,100 for a temporary silt fence on that site. That fence is aimed at preventing turtles from going on the road when they try to return to the RBG property after laying eggs. Tys Theysmeyer, head of conservation for the RBG, said the location near the McMaster property "is a key crossing point for wildlife" between Cootes Paradise and the Dundas Valley, which are the two big natural areas. "The grand plan is to get the wildlife, turtles or animals safe passage that forces them to go under a bridge that goes over a creek instead of going on the road," explained Theysmeyer. He hopes the bridge will some day be modified to better encourage wildlife to go underneath it and provide some public access to observe the animals. Theysmeyer said he plans to approach the city to help pay for the fence because wildlife are being killed on a city-owned road. RBG researchers have been studying turtles on its Cootes Paradise property for several years using radio transmitters attached to the animals' backs. The studies have given the researchers a better idea of where in the marsh the turtles are spending different seasons. Theysmeyer says the bitter winter has meant the turtles are a couple of weeks behind schedule coming out of hibernation. They are just starting to appear now. Normally, in late fall turtles will dig into the ground beside creek beds, below the usual frost line, and spend the winter there. But this winter, the frost went deeper into the ground than usual and some turtles might have frozen to death because they didn't go deep enough. But it's too early to say for sure, he says.